What was the paleoclimate of Florissant Fossil Beds National Monument? The better we understand the past, the better we can predict the future. By learning about how the climate of North America has changed through deep time, we can understand how our world may change in the future. The Florissant Formation gives us a a glimpse into what Colorado was like in the past. Paleoclimate is steadily becoming a prominent field. Right now, paleoclimatologists like myself are trying to analyze and document the paleoclimate around the world throughout time. While some regions and eras are well documented, others are still not as well known. From the extinction of the dinosaurs until the last Ice Age, the global temperature has dropped relatively steadily. However, along the way there were a few drastic ups and downs. The boundary between the Eocene and the Oligocene (~34 million years ago) is marked by one of these drastic drops. The Florissant Formation dates back to the latest Eocene, right before a sudden drop in global temperature. By comparing the Florissant fossils to later sites, we can better understand the global paleoclimate pattern. It is simple to explain why paleoclimate research is important for everyone: our climate is changing rapidly and it is vital to understand how climate change impacted the world in the past. In the words of George Santayana, "Those who cannot remember the past are condemned to repeat it." We will never know for sure what the world was like millions of years ago but research can get us closer. Models are only as good as the data that you put into them, so it is important that we keep testing and retesting our previous work. The Florissant Formation has been studied for decades to determine the paleoclimate and paleoenvironment of Eocene Colorado. However, it is only by building on the work of others that we can hone in on the truth. My research will help to increase our knowledge of the past. The goal of this project is to study and share with others the paleoclimate of Florissant Formation. 1. Determine the mean annual temperature of the Florissant region during the Eocene. 2. Compare my results to previous research. 3. Present my findings at the Geological Society of America annual meeting in Vancouver. My abstract has been accepted by the Geological Society of America for presentation at the annual meeting in Vancouver. In order to attend the meeting, I need funding for a roundtrip flight from Michigan to Vancouver as well as a hotel while I'm there (Canadian customs won't allow me to enter the country without proof that I have enough funds for my entire stay). Also, because I just graduated, I am no longer eligible for student funding. I plan to start my Ph.D. in Fall 2015 and attending this meeting will allow me to share my research and meet potential advisors and collaborators. Funding this project will allow me to continue this kind of research in the future. Aly Baumgartner is a paleoclimatologist who uses fossil plants to reconstruct paleoclimate. 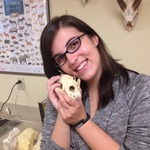 She earned her Bachelor's of Science in Program in the Environment with a minor in Biological Anthropology from the University of Michigan, and earned her Master's of Science in Biology from East Tennessee State University. She plans to begin her Ph.D. in Fall 2015. When Aly isn't analyzing data on her computer, she likes to share her love of science with others through public outreach. You can check out her blog here. I was lucky enough to spend 3 months working at Florissant Fossil Beds National Monument and it was beautiful!